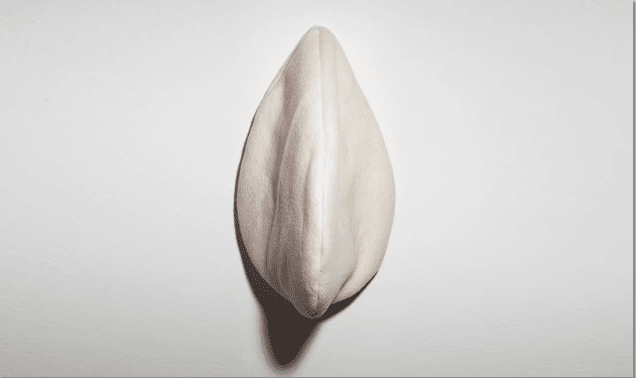 Now based in Philadelphia, where she practices in addition to working at the University of the Arts as the Program Director of Material and Craft Studies, the artist – who recently completed a year-long fellowship at the Center for Emerging Visual Artists – reflects on how her upbringing informs her practice. “Bubble #4” (2009) is made entirely of pipe cleaners. NM: Tell me about your childhood. What drove your interest in art? Mi-Kyoung Lee: I grew up in South Korea, I was born in Koji Island which is located on the southeastern tip of the east coast and one of the largest residential areas. When I was growing up it was a quiet, primitive, and not very developed and I spent most of my entire summer and winter break in the village. I was born in the village but left to the city when I was little. My brother and I first day of our break would go there. Very vivid memory of spending time in nature. The Pacific Ocean was the backdrop and you have these mountains and rice and vegetable gardens. It was primitive and wild, no stores, not much electricity, and very raw with just 26 or 27 small households. The village kids and I hung out and spent entire summer in the ocean catching fish, picking berries. The most amazing experience for me as a child. Besides this wild experience in nature, I remember I just drew a lot and my father – he’s the one who showed me how to draw – he was really good at drawing. I was so mesmerized I spent every day at the art center and it was a path of my days. I think when I was in elementary school I got awards for art, but when I went to middle school, then high school I realized that I was missing drawing from my adolescence. So I decided then I would focus on art. 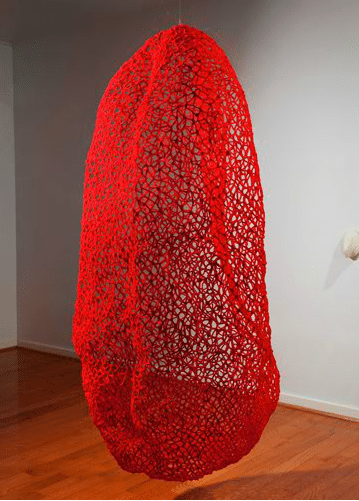 NM: How did you land on a path within the fiber arts? Mi-Kyoung Lee: So what happened was when I was selecting a major in college, I didn’t know too much about fiber and I was studying design and I just generally extended design for the crafts. When I was consulting with my art teacher, he said fiber is the most closely related to fine arts among crafts and he thought it would be a good route to explore. The exciting thing about fiber arts is that it’s an open medium and I’m attracted to it because its related to a woman’s life. It’s much more connected to domesticity, and I remember feeling especially connected to growing watching my grandma making blankets and clothes. I think of those types of daily routines, my own experience with her and my mother. NM: Would you say that your work is particularly feminist within this context? Mi-Kyoung Lee: I think that’s particularly the essence of it. As the mother of two children, my practice comes with so much feminine and that’s what I brought in from my childhood, and I think my aesthetics and approach is connected to that. It’s hard to kind of separate it. 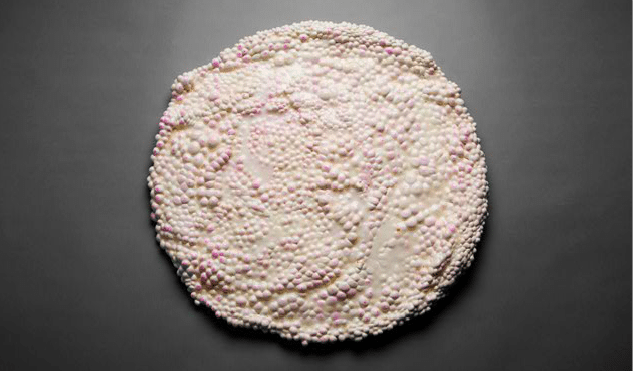 “Untitled” (2006) is comprised of foam clay, glue, and ink. NM: How do the materials you use comment on these ideas of domesticity and labor? I feel like your work is also significantly reflective of your childhood growing up in Asia. 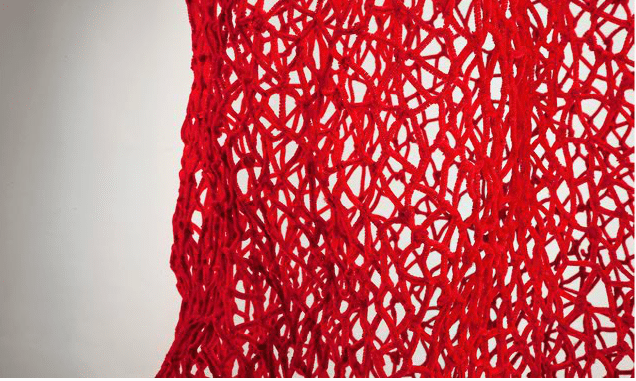 Mi-Kyoung Lee: I mainly work with thread, twist ties, and plastic. But I think ultimately my interest is the labor and beauty of the labor. And that’s my metaphor of what the textile and craft are about. In a way, I put an emphasis on the intensity and repetitions and I think those really underlay to my work. I think at the same time the sense of touch is an important element and in particular plastic and bringing a symbiotic relationship to what we face between nature, art, and plastics every day. Those are always questions in my work. NM: Why did you decide to move to the U.S. to develop your practice? Mi-Kyoung Lee: In 1992 I was a senior and I was going to go to grad school and I decided I wanted to pursue and work more in-depth with my artwork. But I was traveling to Europe with my teachers and fellow colleagues and I went through Europe and other major cities for the art scene but I thought it was still a little quiet and I wanted to go to Germany because one of my colleagues who studied in Munich said it was wonderful. But unfortunately, the language was challenging. My school had amazing fiber artists and one of them recommended I go to the U.S. In the early 90s, it was primetime. It was a hunger to learn – I felt like I needed to see what was out there. I didn’t plan to stay longer but I was attracted to the art scene. It was three years that then became five years and then became ten. I think the teaching has really kept me here. Really my past 10 years of work is very clearly influenced by my teaching of textiles. When you teach a specific medium and you learn more and investigate more, you continue to question and learn more from your students.. They have so much inspiration and imagination and it’s a great interaction. I think teaching in a way really shaped who I am as a maker because I push myself to question and do better for my students. NM: Why did you start teaching? Mi-Kyoung Lee: I didn’t really know that I was going to teach. The reason I’m teaching is that I like to share, I like to see the students transform, guide them through what they need. So my own practice could have helped them but I just really enjoy interacting with students. It’s not only making art but it’s sharing about our lives. In a way, they always in a way give back to me. It’s an exchange. Seeing this younger generation, how they think and feel is exciting to get to know. NM: How do you balance teaching with making your own work? Mi-Kyoung Lee: During the academic semester it’s very difficult to make my own work. You have three to four days of studio teaching and its quite enormous and you have to prepare. During the semester sometimes I have small pieces at the ready or work on somehow developing a larger piece. During the academic semester, my energy is much more focused on teaching. I use a lot of my summer/winter break and that’s where my production time comes in. I’m very lucky because I have great relationships with galleries so I feel like I have at least four exhibitions every year, including solo shows. So for the past 15 years, I’ve presented my work through galleries so mostly there. NM: Why do you think its important for artists to apply to grants and awards? Mi-Kyoung Lee: Particularly in the U.S., I think it’s important to emphasize to my students that they need to be able to write because there’s a lot of grant resources out there. I think you need to be very clear about what you’re looking for, I think artists should be smarter about the resources that are out there. In particular, in our field of fiber, the practice is personal but it has much more possibility. The project can be larger and have a sense of materials, you can have installations and community projects, so you really get the resources and can extend your practice in a much larger way. “Face” (2009) is formed with beeswax and wool felt. Courtesy of the artist. NM: What have you gained from being a fellow at CFEVA? Mi-Kyoung Lee: It’s been an amazing experience. The staff has been amazing to bring many resources to my professional practice and really pushing me to my next step and what I’m looking for. It’s not just about my exhibition but gave me thought about where I am and how I’m projecting my work into the future. They offered really incredible support and also helped me make good connections. I also enjoyed reviewing my work with the curators and having an interesting dialogue with fellow artists. NM: What’s your advice to emerging artists? Mi-Kyoung Lee: This is quite consistent with what I tell my students, as well. It’s sometimes – when I graduated from Cranbrook I felt a little lost. Working toward a grad degree those two years were so intense and you finish and you’re like, what happened? You have to keep making and you have to show. Once you do it on a regular basis, you’ll be able to see the growth and change. Once you’re out in the community you lose the routine, but I think the people who really push themselves to show are the ones who survive. No one is going to come and see your work, you have to put it out there.